depth within the painting. Through a mastering of contour and shadow, Hagerty creates a multiplanar world the viewer can nearly jump into. Peter Vandermark’s series of works on display includes 10 geometric, sculptural imaginings of humanity’s interaction with space and the built environment. This group of abstract threedimensional works is composed of timber along with painted and mirrored acrylic. Stemming from a commentary on the modernist desire to integrate both life and art, these geometric and reflective pieces render a unique spatial experience for the viewer. For Vandermark, the relationship between the work and viewer is a private and intimate experience. Simultaneously, Vandermark’s sculptures are models of architectural landscapes; creating an abstracted and interior landscape of wanderlust. In a designed and curated modern world, Vandermark’s work analyses the evolution of humanity’s interaction with scale, dimensions and textures of inhabitation. Marie Hagerty (b. 1964) is a Sydney born artist who shifted to Canberra about 30 years ago and has been working primarily as a painter. Hagerty has a very effective and curiously unusual hybrid approach, both in her techniques of painting, employing traditional oils and modern acrylic, as well as in her conceptual framework. She seamlessly combines within a non-figurative composition seemingly figurative elements realized within a high degree of verisimilitude to surfaces and textures. Above all, her paintings display a high degree of visual intelligence in their subtle play of push and pull optics across the sensuous rolling surface. In recent years her paintings have been included in curated and invitational exhibitions at the National Gallery of Victoria, the Ian Potter Museum of Art in Melbourne, the Gallery of Modern Art in Brisbane and the Canberra Museum. 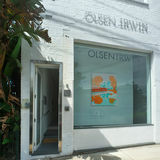 Hagerty is represented by Olsen Gallery in Sydney and Karen Woodbury Gallery in Melbourne. Peter Vandermark (b. 1960) is a Melbourne born artist interested in the evolution of humanity’s interaction with an increasingly artificial and curated world. 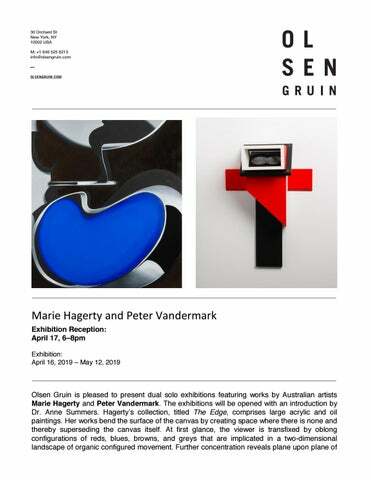 "It is one of Vandermark's strengths as a sculptor that he absorbs and explores the entirety of the designed three-dimensional world, rather than only having a dialogue with the past fine art sculpture. His interests are in the domestic, the urban, the architectural, the mechanical, the semiotic (signs and signage), and even the way in which spoken language can manifest as a ‘solid’ which impacts upon the world."